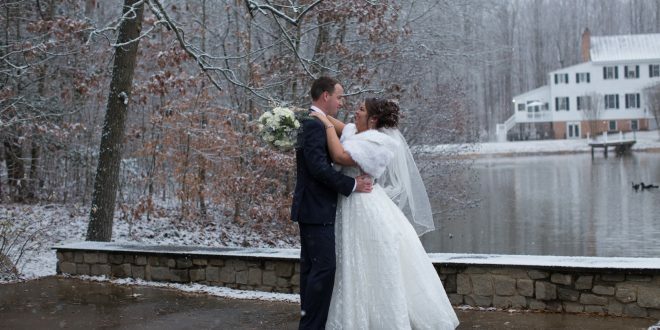 Courtney and Tyler said “I do” at The Lodge at Stevenson Ridge in Spotsylvania County, VA and designed their winter wedding with a silver and blue theme, foregoing the traditional red accents of the season. A large monochromatic Christmas tree greeted guests in the lobby of the lodge where the rustic, holiday charm of the venue inspired the couple to deck its halls with lush evergreen and sparkling silver decor. Details like large vases filled with blue and silver ornaments complimented the winter theme and fluffy flakes of snow fell as Courtney, Tyler and their wedding party posed for portraits by the lake. Courtney made a beautiful “snow bride” in her traditional ballgown with its deep V neckline and shimmering sequined skirting and her bridesmaids were wonderfully wintery in their silver gray gowns. The bridal bouquet was a stunning mix of white florals, succulents and eucalyptus and the baby’s breath bouquets the bridesmaids carried were like delicate puffs of snow. Tyler and his groomsmen were dashing in navy blue and each gentleman pinned a single white rose boutonnière to his lapel. Pine cone details and plenty of twinkling lights could be found throughout the reception space and we just love that this clever couple hung “ornament” place cards on a Christmas tree to serve as their seating chart. Congratulations Courtney and Tyler!